MOR latest addition to the Emporium White collection is truly to lust for. 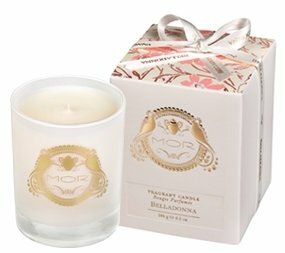 Released in time for the warmer spring season, the Belladonna range is a sweet bouquet of white narcissus, Moroccan rose, pink tulips with a freshness of Meyer lemon, and sweetened with vanilla, musk and sandalwood and French Cassis (currants). This soft and feminine scent has an air of feminine powdery complexity that will surely take you to the provincial era where life was less hectic and more romantic. The range covers the traditional MOR body luxury products with a bar soap, hand cream, body butter, and scented candle - all luxuriously packaged with pink blossoms, gilded gold leaves print and decadent MOR logo embossing. Being a hand cream lover, I immediately gravitated toward the product and had to give it a go myself. The box is beautiful and the tube elegant, the latest hand cream sits proudly on my desk at work with its bulbous gold cap providing it an opulence and style that no other hand cream in my collection has. Packed with moisturising cocoa butter, shea butter, glycerin and vitamin A and E to protect, this hand cream is rich and creamy but is lightweight and absorbs instantly to leave skin supple, velvety to touch and lightly scented for hours. It is especially great for dry fingers during the day with constant handling of paper and the drying office air conditioner. After a week of use, even the rough ragged bits on my index fingers were tamed and smoothed into soft digits. Hallelujah! This scented candle will enlighten up your room and world with the heavenly Belladonna scent and will give your home a touch of old world charm in the frosted glass jar gilded with 24 carat gold logo decal. What I love is that within 30 minutes of burning this candle, your whole room will be warmly scented with the Belladonna signature scent which gently wafts to fill all corners of the house and have it smelling like a spring bouquet of delicate florals. And if you need more reasons to love this artistically presented candle, you can't go past the long burn time of 40 hours for days of endless enjoyment, the clean and smoke-free burns you get with the 100% soy wax and lead free cotton wick (for even burning of the candle, I advise to burn for no more than 3 hours each time). 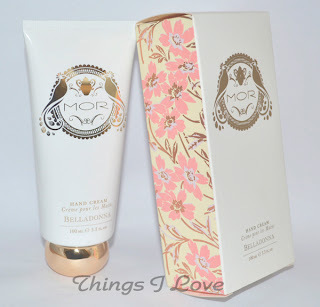 MOR body products make amazing gifts that is always welcomed and love with their precious and pretty packaging and Belladonna is another fine example of the decadent attention to detail that we've come to expect. It is also something you can indulge yourself with for a little touch of luxury in your everyday life and I'll be giving you a chance to win some of your own Mor luxuries Belladonna shortly. Stay tuned here! 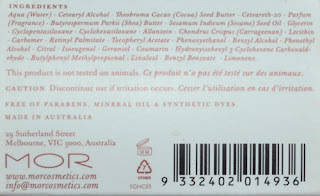 Hand Cream RRP A$24.95| Scented Candle RRP A$39.95 at Myer, David Jones, selected pharmacies and MOR online. I love Belladonna! 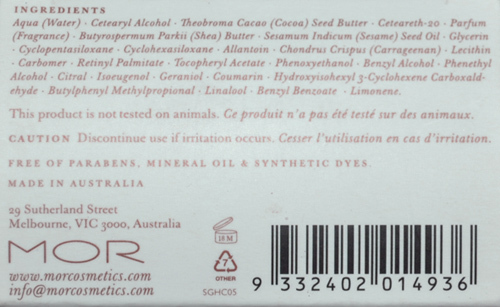 It is my favourite of the Mor roll on perfume oils :) Nice to know they make other smelly goodies in the same scent! Hehe Su - you are possibly the most scented lady I know. What perfume have you not whiffed?